Here is another perk of being a valued 3 Garnets & 2 Sapphires reader! In early June of 2010, I had announced that I was chosen to be one of the first ever Constructive Moms team members to bring you honest reviews, fun giveaways, and the latest news from one of the leading resources of quality toys . . . Constructive Playthings. Well, Constructive Playthings has generously offered my readers an ongoing discount of 15% off your online purchases. This is not an affiliate link and I do not receive any compensation for your shopping on Constructive Playthings. This is simply an exclusive discount for those who visit the sites of the 12 Constructive Moms. There are 3 ways you can receive the 15% off discount . . .
Click on the Constructive Playthings button in the upper left corner of this post. Click on the Constructive Playthings button found under "Sponsors" towards the bottom of this page. 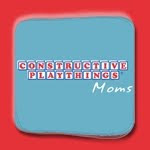 Click on this link: I want to save 15% off online at Constructive Playthings! Have fun shopping! And if you happen to buy some cool toys, feel free to leave a comment here to tell me what you purchased. I love hearing about great shopping finds! !